Terminal Address: 2990 Main Street, Alameda, CA 94501. Search nearby locations or get directions to the Alameda Main St. Terminal. Bike Accommodations: There are 20 secure electronic bicycle lockers available using the BikeLink card system. Visit www.bikelink.org for more information. In addition there are bike racks that can accommodate up to 62 bikes. Terminal Address: 215 Adelphian Way, Alameda, CA 94502. 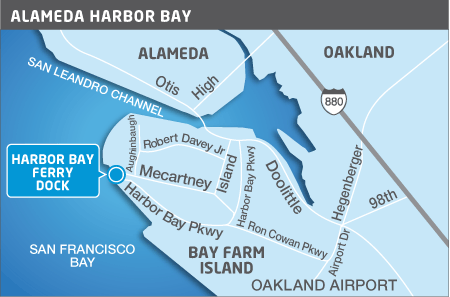 Search nearby locations or get directions to the Harbor Bay Terminal. 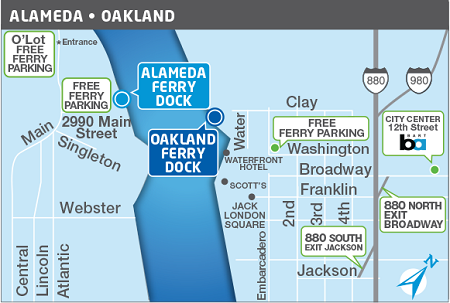 Terminal Address: The Oakland terminal is located at the west end of Jack London Square; Near 10 Clay St, Oakland CA, 94607. Search nearby locations or get directions to the Oakland Terminal. 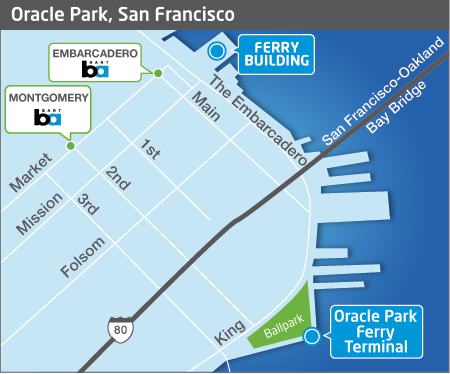 Terminal Address: The Ferry Landing at Oracle Park is located near the Seals Plaza / Marina Gate of the ballpark. The address for Oracle Park is 24 Willie Mays Plaza, San Francisco, CA 94107. Search nearby locations or get directions to the Oracle Park Terminal. Parking at Oracle Park: Paid parking is available but limited around Oracle Park; riders are encouraged to take public transportation. Terminal Address: 1453 Harbour Way South, Richmond, CA 94804. 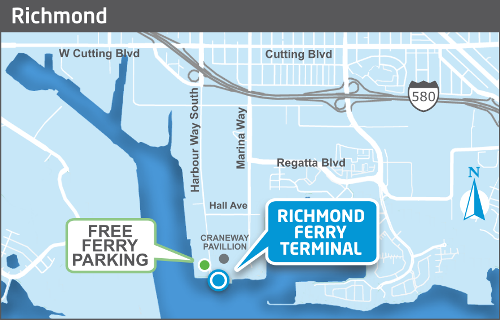 Parking at the Richmond Terminal: Free parking for ferry customers is available in the lot adjacent to the terminal and includes 362 spaces, with 15 public access spaces and 8 accessible spaces. Please note that the lot is unattended. No overnight parking is permitted. Parking is first come, first served. Getting to the Terminal: Access the terminal from Interstate 580 and the greater Richmond area by car or bicycle. (We're on the Bay Trail). Get directions here. AC Transit Line 74 operates between the Richmond Ferry Terminal to central Richmond, including the Richmond BART and Amtrak stations. Bike Accommodations: There are 20 secure electronic bicycle lockers available using the BikeLink card system. Visit www.bikelink.org for more information. Additional bike racks are available. You are welcome to board the ferry with your bicycle. Terminal Address: Pier 41, San Francisco, CA 94133. 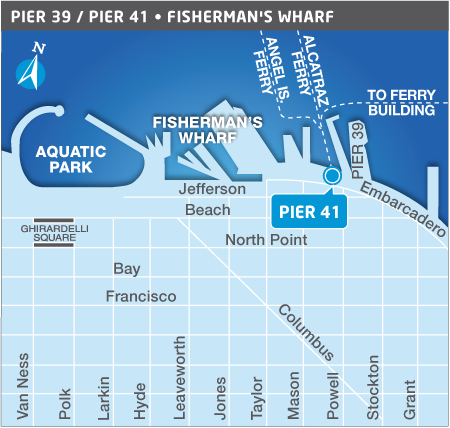 Pier 41 is located immediately adjacent to the Pier 39 entertainment complex. Search nearby locations or get directions to the Pier 41 Terminal. Parking at Pier 41: Parking is available at an hourly fee in the Pier 39 parking garage, located across the Embarcadero from Pier 41 and Pier 39. Terminal Address: 911 Marina Blvd., South San Francisco, CA 94080. 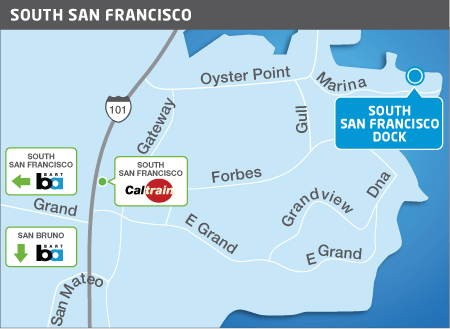 Search nearby locations or get directions to the South San Francisco Terminal. Public Transit Options: Please visit the South San Francisco transit tab for information including Commute.org shuttle services. Mare Island Terminal Address: 1050 Nimitz Avenue, Vallejo, CA 94592. Search nearby locations or get directions to the Mare Island Terminal. Parking at the Mare Island terminal: Initially, there will be no parking fee in Mare Island. 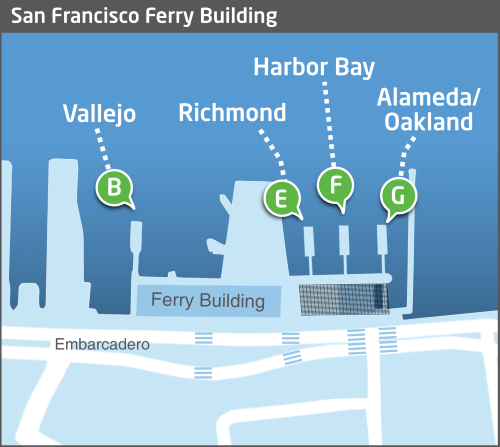 Ferry riders may park in designated areas at the terminal. 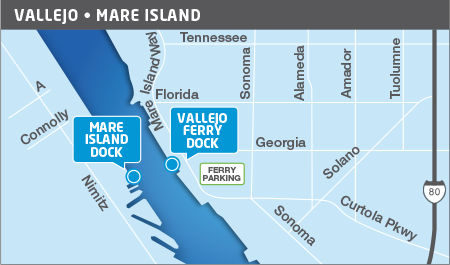 Vallejo Ferry Terminal Address: 289 Mare Island Way Vallejo, CA 94590. Within the Ferry Terminal you will find the Ferry Terminal Ticket Office, Panama Red's, and the Vallejo Convention & Visitors Bureau. Search nearby locations or get directions to the Vallejo Terminal. Ticket Office: Vallejo Ticket Office hours are: Monday through Friday, 6:45 AM to 5:00 PM Saturday and Sunday, 8:00 AM to 5:00 PM. To accommodate customers who wish to purchase a monthly pass, the Ticket Office will open at 5:00 AM for monthly pass sales on the first and last two weekdays of the month excluding holidays. In addition, when there is a weekday night Giants game, the Ticket Office will stay open until 5:45 PM to accommodate customers taking the 5:45 PM Vallejo departure to the San Francisco Ferry Building. Parking in Vallejo: Daily and monthly paid parking is available directly across from the terminal in the City of Vallejo’s waterfront parking garage. Daily permits can be purchased at the machines which accept cash or credit card throughout the garage. Have your vehicle’s license plate number when you use the machine to reduce purchase time. To purchase a monthly permit for the City of Vallejo’s waterfront garage, please visit the City’s website. Public Transit Options: The Vallejo Ferry Terminal is just a block away from the Vallejo Transit Center, where connecting bus service to the Napa area via the VINE, and to Vallejo, Benicia and Fairfield via SolTrans, are easily accessible. Bus service between San Francisco and Vallejo is provided by the Route 82 bus beginning January 2, 2017.